Scott Youkilis is the blog-writing technology-savvy chef/owner of Maverick restaurant in San Francisco's Mission district which I visited last Monday night with a bunch of girlfriends. One of them Catherine, had been charged with finding a venue for our meetup and after a successful first visit to Scott's American style eatery & wine bar a day earlier asked us if we would agree to Maverick being the location for our celebration. Once we heard that all wine is 40% off on Monday evenings, we could hardly resist, could we? But a funny thing happened when she called to make the reservation, only a day or two after she had first dined there. "Aha, Catherine", they said, "we remember you, we just read your blog entry". Her Maverick post had been on the web for less than 24 hours and the restaurant already knew about it. I was surprised. It takes a couple of days for the google bots to add new entries to the search engines and Catherine didn't link directly to the restaurant in her blog, so they couldn't have found her blog through visitor referrals. When she asked how they found the post, they replied that their PR company had called to let them know. This is something I hadn't considered before. Restaurants employ public relations people, and these people clearly do have blogs on their radar. "Q: Do you announce when you're coming to a restaurant? I can only imagine, then, that Bauer doesn't fully understand how the internet works. His blog undoubtedly will have sent hundreds of its readers to the Vitri website and if they are savvy or employ a savvy PR company, they could easily have deduced that a well-read food critic was heading their way and prepared accordingly. "I've designed websites for several restaurants, SB, and obviously there are many levels of users, but the all chefs and restaurateurs I know can barely turn their computers on without help, so I'd be pretty shocked to find them pouring through their website stats looking for incoming traffic." and "yeah, I read a couple chef blogs but even those guys are hideously busy -- too busy to bother with web metrics." Prepare to be shocked, johng, restaurants, particularly new ones, do check web metrics. Chefs and restaurant owners deserve more credit. This lowly blog, hardly moving in the same wide circles as Bauer has, after writing restaurant reviews, garnered quick responses from several restauranteurs: the owner of Dosa, Anjan Mitra, The Chef of Range, Phil West included. I have a friend who owns several restaurants in San Francisco who would perhaps unfairly be dismissed as one of those people who "can barely turn their computers on without help", but this didn't stop him from working out how to leave a comment on my blog the other day. I could cite you dozens more examples of how I can prove that restauranteurs do know what is being said about them on the internet but I hope I have already proved my point. Times are changing, chefs are cottoning on to the power of the internet and their presence online will only become more and more prolific as time goes on. Maverick's Scott Youkilis and other chefs like Brett Emerson who will be opening a restaurant called Olallie in Noe Valley next year and Carlos Carlo Middione are at the forefront of this new trend of blogging, web-savvy chefs. Having a blog makes the relationship between the chef and the customer so much more personal and I think it is something that customers could really warm to. Unless they behave like arseholes, chefs are not going to make enemies from sharing a bit of themselves on the net. At the end of our really fun meal at Maverick last Monday, I turned to our server and asked if the Chef I could see working in the kitchen was Scott. "I read his blog", I said. He called over to Scott and said "They read your blog". Scott looked up from his work surprised perhaps, but with a big beam on his face. "Did you read it yesterday", he said excitedly "I just updated it". I told him I had a blog too, and so did she, she, she and she. It felt different then. It almost like I'd been for dinner at a friend's rather than just a.n.other restaurant. PS Watch Scott Youkilis show you how to make a great stuffing for your Thanksgiving turkey. PPS - Don't forget today is the start of the week-long photograph everything you eat challenge. Will you be taking part too? Your post has been a big talking point in my house this morning. We saw it very early just before my son Trig went off to college, and his brother Joel, who is a graduate in business economics, also found it fascinating. They say that whatever happens in the US generally arrives in the UK about five years later. Right now I certainly couldn't imagine a British restauranteur welcoming guests whose blog postings they had already read (or been made aware of by their PR consultants). But it's coming and in my family at least we are convinced that anyone who does not mordernise their attitude to customer relations and marketing will fail in the new world of e-commerce and e-adversing. That is one of the reasons that Trig is blogging know, in preparation for web communications when he becomes a professional. We all went to a top-class local French restaurant on Sunday and Trig will be writing it up on his blog in a day or two. The food was great, but, judging from the small number of customers, this particular restauranteur needs to market his services more effectively. So we will be interested to see whether he picks up on Trig's review. I doubt it, but you never know. Sorry, I meant before my son went off to work experience, not college. Don't want to cause any upsets! Sam this is interesting stuff. It is happening in the UK already. I've been contacted by PRs for restaurants I've written about. The thing I found most intriguing was that a restaurant has linked to my review in their press section. I realised when I was checking my own stats. Unfortunately at the time of posting, the restaurant's website seems to be down, but it can be found at www.thelock-diningbar.com/ . I haven't seen this happen elsewhere, although I'm sure it does. I wonder if they would have done the same thing if my review hadn't be glowing? Sam and the rest make several interesting points. I, too have had a few restaurants link to my reviews. I've no idea if they found them via Google or their PR folks (or on their own), but there is no doubt that in SF they -- some of them, anyway -- are reading. I can see both points of view - there are a LOT of food pros who do not have the combination of time and interest to be interested let alone involved. On the other hand, any restaurant marketing-savvy enough to have a PR agency OUGHT to be up on blog posting. Doesn't mean they are going to do it themselves necessarily. But I do think that over time this will become more and more important. Especially since blog readers tend to be for more heavily involved. I am willing to bet that the readership of your blog on average spends literally ten times as much on dining out at nice new restaurants in San Francisco as does the readership of the Chronicle (per person that is). In terms of order of magnitude I'd guess about 50,000 people read Michael Bauer every week (about a tenth of those who read the paper). And about 2,000 people read you every week. (I'm guessing here). But in real terms your readers carry ten times the weight. That means that you already carry almost half the influence with the dining public that Bauer does. I'm exaggerating a little here, but not a huge amount. I'd bet that if you put the top ten SF-based dining out blogs together and looked at their impact on the scene versus the Chronicle it wouldn't be all that far off - certainly close enough that PR agencies and restaurants OUGHT to pay attention. Your post today was provocative and I am passing it on to several restaurant pr people I know who occasionally, but not always, do keep up with bloggers. sorry about spelling Carlo's name wrong everyone, I have fixed it in the post. The warning was much appreciated. My blog costs me so much, i can't afford an editor. Some chefs have blogs, work in major computer stores, understand "traffic" and forward post to chefs whose restaurants were written about. This is an incredible topic, as we all know we are being read by "the major print media players." One need only understand an IP address to find this out. But I will say, that the majority of line cooks/pastry chefs and savoury chefs do not have the time or the understanding of computers to take the time to understand more fully the impact the internet has on their careers/industry. In SF we have a lot of the dot bombers taking all their loot and opening restaurants. In this way, many of them come from the tech world to begin with. I'm thinking long and hard about doing the photo challenge!! Well, Silverbrow, I'm amazed. I've just seen the link to you on that restaurant website. Maybe we're catching up with the Americans these days. I would never have thought I'd see such a thing. I guess we all need to be careful about what is published. Maybe someone whose trade drops off after a critical posting would consider suing? Perish the thought. PS. The Lock looks great and it's not far from me so I must try it soon. I do understand that this phenomena is not overly common, but the ratio of internet savvy chef is increasing and will continue to increase so it is definitely something everybody, especially those in the hospitality industry should start thinking about right now, especially if they want to be able to keep up with the times as we head into the future. thanks for all your thoughts everyone. Can't believe my ears weren't burning and I almost missed this. I'm shocked! Well, there are many exceptions of course but I will stubbornly maintain that most cases it's the support network inside and outside the restaurant that clues these people in. 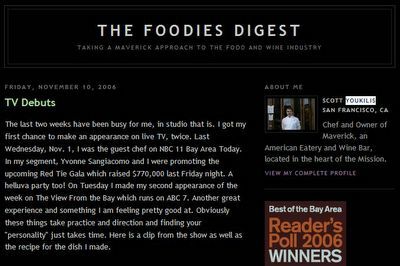 In fact, I keep an eye in incoming links, and forward links to blog reviews to chefs I know so that they'll know what's going on. Same thing for my winemaker friends. In a sense, this is not new. I worked for a chef over decade ago who did not own a computer, but he couldn't sleep for a week because his PR person had told him about somebody trashing the place on a usenet group. seriously - i have a restuaranteur friend and if you talk to him in any internet savvy terms, even basic ones, he doesn't understand what an earth you are talking about, but despite being a long long way outside of his comfort zone, he soldiers on and slowly but surely he susses things out online. If he can do it, anyone can!